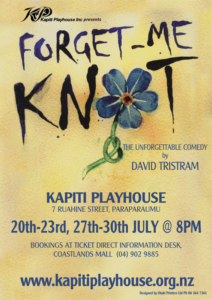 Forget-Me-Knot - Kapiti Playhouse Inc.
20th-23rd July and 27th-30th July at 8pm. Bookings are now available from Ticket Direct Coastlands Information Centre or by calling 04-902 9885. Adults $22, Students/Senior Citizens $20, Groups of 10 or more $20. Tickets can also be purchased online via the TicketDirect website. Please note that additional fees may apply for online sales.